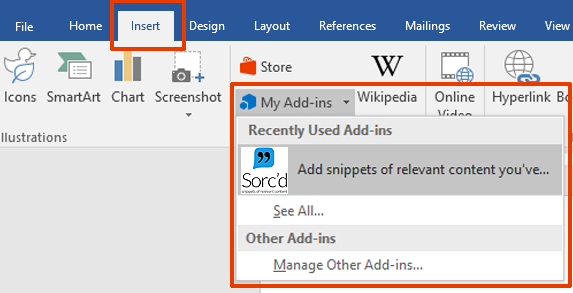 There are three tool types available for Microsoft users: an Edge Extension (Chrome is also available) for capturing snippets of information and two add-ins for integrating the snippets into your content or exporting snippets from your content into your Sorc'd account. An extension is just a tool used to enhance your browsing experience in Edge. Step 3: Install the Microsoft add-in for Office and Outlook. While in Outlook, click on the settings gear at the top. Click on MANAGE ADD-INS from the dropdown. Search for SORCD and then click ADD from the popup window. Step 4: Using the Microsoft add-in for Office and Outlook. Once installed, launch the Sorc'd add-in directly from within Microsoft Word, PowerPoint, Excel or Outlook. Microsoft requires that you launch add-ins upon every new document or message. A task pane on the right-hand side will give you all the benefits of Sorc'd. 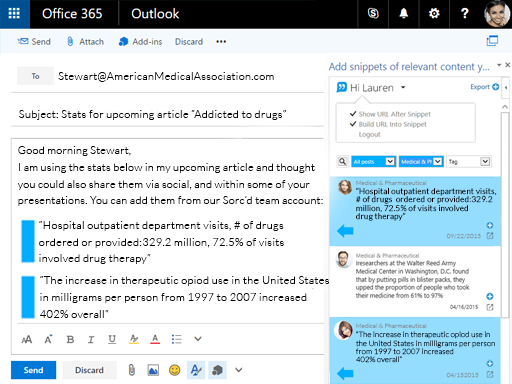 Here is an example of what it looks like in Word and Outlook.